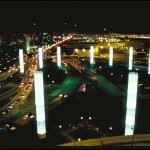 The overall concept was centered on the pylons functioning as both beacon and gateway to Los Angeles. The pylons were a wonderful scale and would create an enduring presence, so one of the more crucial components of the piece was not ruining an already elegant architectural feature. 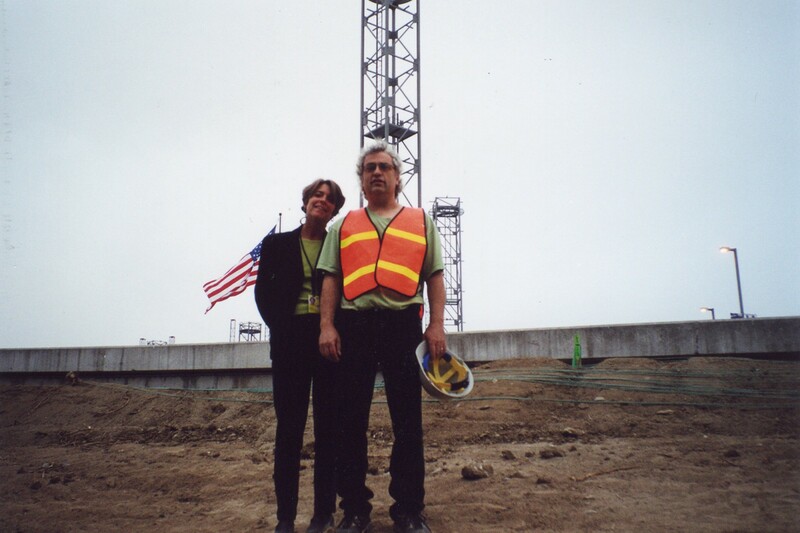 From the onset, it was important to me that this landmark become a long-lasting piece for Los Angeles -- therefore it was crucial to maintain the pylons’ monolithic stance. I wanted to create a landmark installation that still dealt with its location and purpose, while maintaining and amplifying its overall scale and complexity. 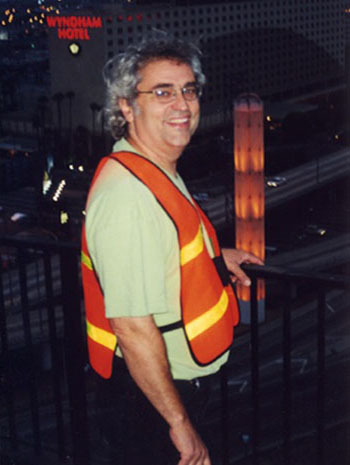 It was clear that this installation dealt with the greeting factor as a unique welcoming feature to travelers and the Los Angeles community. I set out to create a focus in a very diffused and eclectic environment. 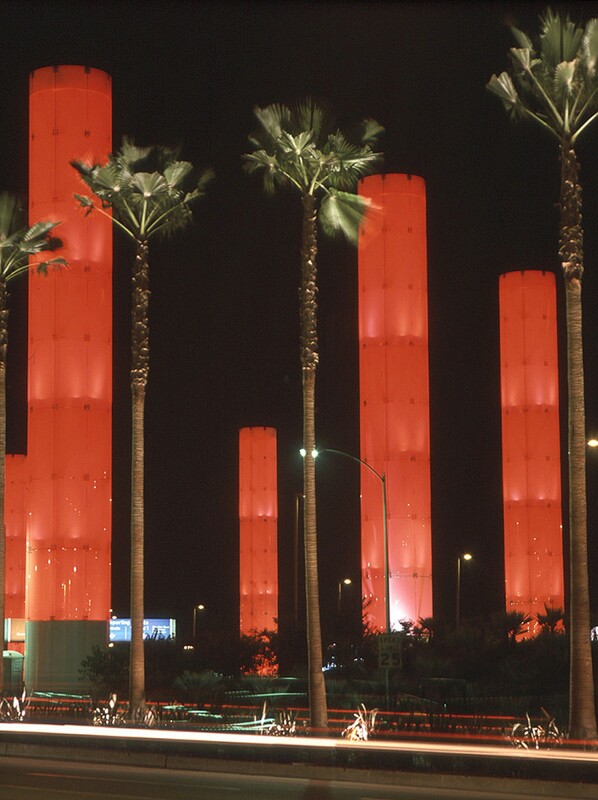 Thematically, the pylons on Century Boulevard are illuminated so as to create a welcoming motion toward the airport. 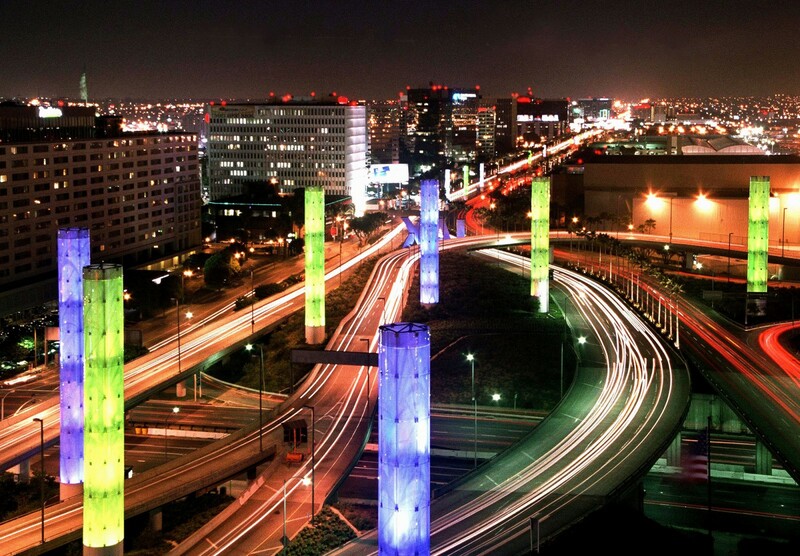 The pylons in the circular central exchange (at Century and Sepulveda Boulevards) receive their motivation and color from this movement. 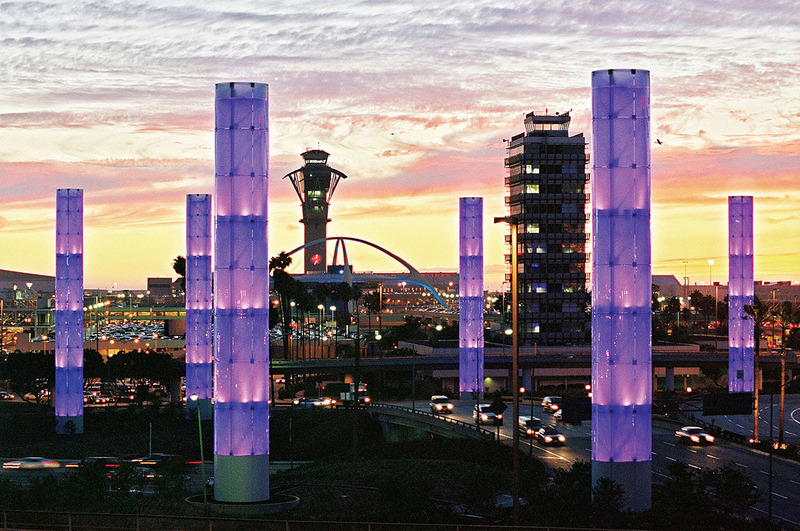 The colors metaphorically work from the airport out to the greater Los Angeles community – and beyond. 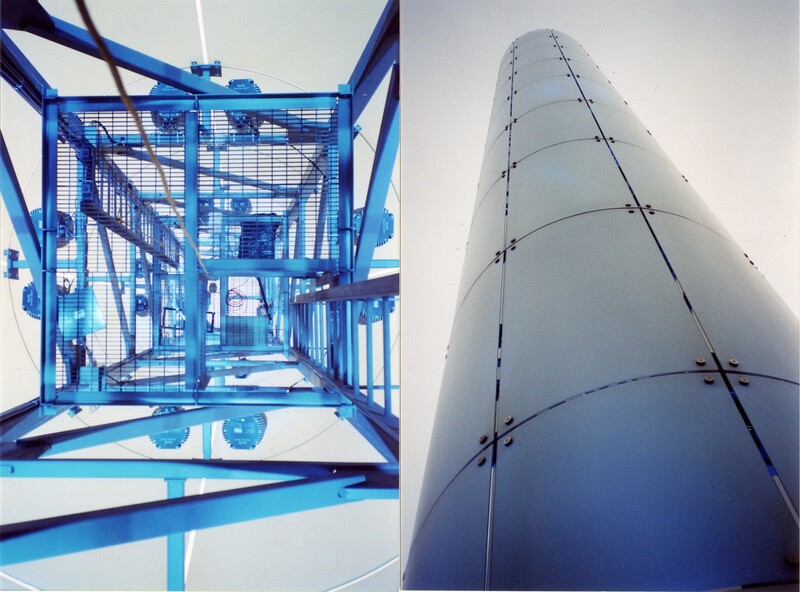 The colors begin with white purity and transition to a blue thematic position illustrating the airport.  Next is a color specifically attributed to represent the combined light of the universe. Following is a sequence of red, white and blue illustrating the specificity of place (the United States, with LAX as a gateway), and then the colors transition to greens and blues, evoking terrestrial concerns and ecology. The palette continues with rich, emotional values and hues that relate to my long-standing work with cultural patterns and colors of our ethnic diversity (saturated hues derived from ethnic textiles, flags, and regional art forms), and then transition to kinetic displays evoking modern notions of movement and technology. The color palette is further amplified by my use of fades and transitions between colors to create thousands of transient, organic colors. 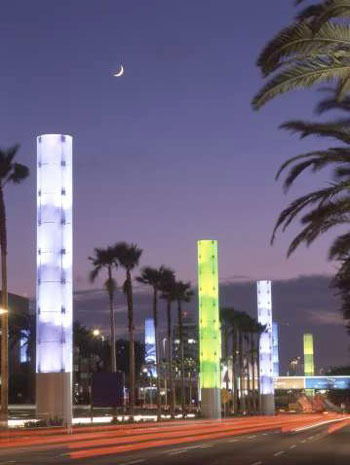 (year 2000 Installation) The colors were selected by working with lighting manufacturers to maximize the color saturation and color intensity. These custom colors, ordered from Danish lighting manufacturers, were selected to produce vibrant, rich, emotional potentials to all the pylons. The colors are calculated to be uplifting, bright, provocative and seductive. The saturated colors were selected to overcome some of the issues of transparency in the pylons, so they remain monolithic and monumental. 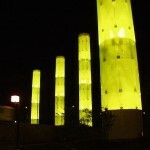 The choreography of the light display utilizes simple metaphors of volume and movement of large cylinders. 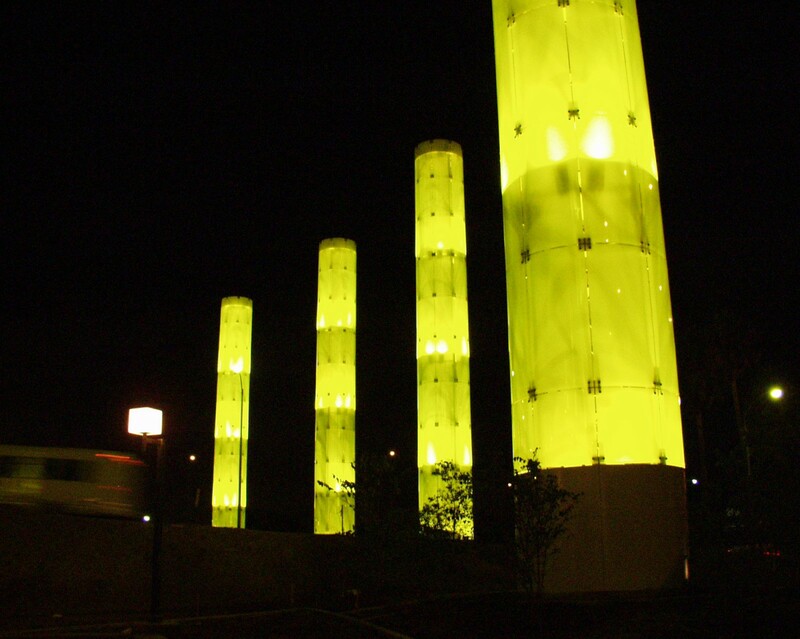 The pylons swap places by swapping colors; they appear to march and move with the lights’ movements; they fill and empty, as if one were pouring in color or allowing a fluid to run out. The overall geometry of the light movements is only apparent from an aerial vantage point, which leaves the patterns and movements as intriguing color and spatial kinetic paths. Further, these movements represent time passing and geographic compass positions. The movement was designed, again, with site specificity in mind, that the entire installation was not to entertain, but to create an emotional space that one could take with him/her at a glance, while in transit or from a longer assessment at some local structure or airport venue. The sequences move slowly so that the driver-by and pedestrian glimpses should leave the viewer with a specific look and feeling, rather than one of something in transition. The overall calming effect is calculated to diminish the hectic and frantic state within which most patrons participate. The program repeats on a multi-hour cycle, so as not to seem predictable. It is important to me that these colors and movements appear random and organic and still have a tranquil quality. 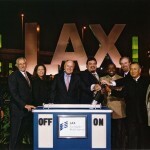 I would hope everyone visiting LAX – every time – would be left with a different emotional impression. The program’s length, pace, and texture are designed to provide unique experiences, per visit. We’ve allowed for video projection potential in all the pylons. The wiring as well as other technical aspects are in place so that video can some day be part of the art. In my initial proposal, there would be five pylons with fifteen projectors (3 per pylon) that would project images in pre-selected zones of the pylons for the driving and pedestrian public. 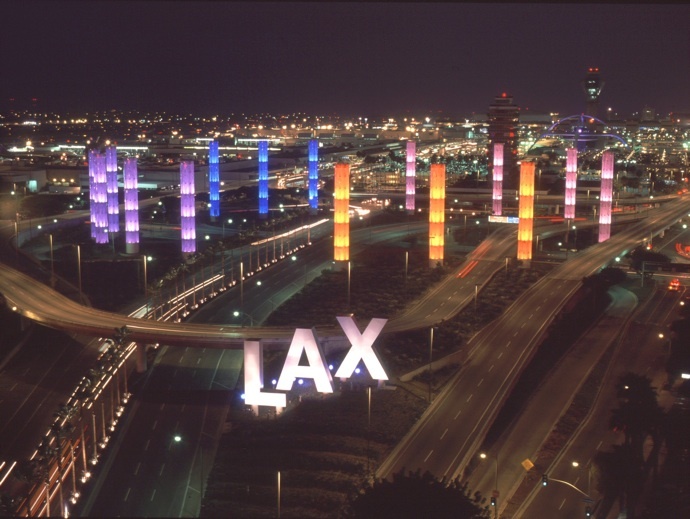 These images were selected with a similar theme as the lights, creating a sense of place through movement and images of the airport, Los Angeles, and beyond. 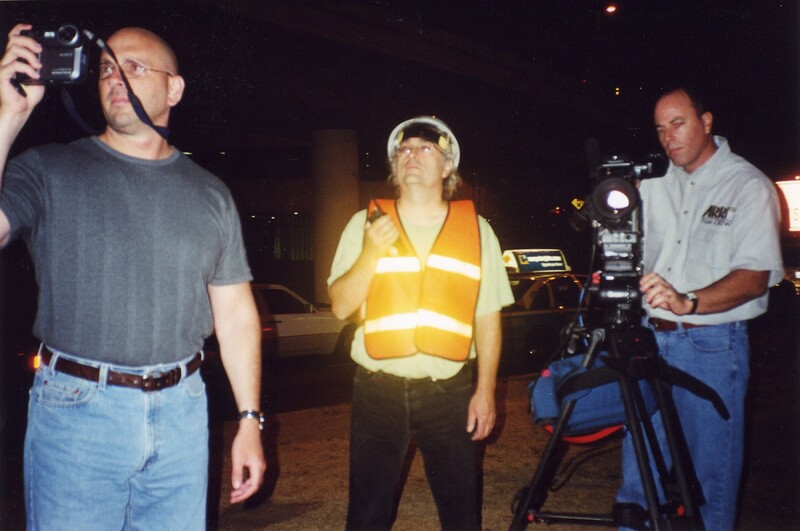 Since 2000, I have realized a permanent, large-scale projection installation in Los Angeles, see “e/motion 3” (2004). 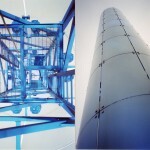 Also see “Tower Days” for early projection and video projection work (1974). 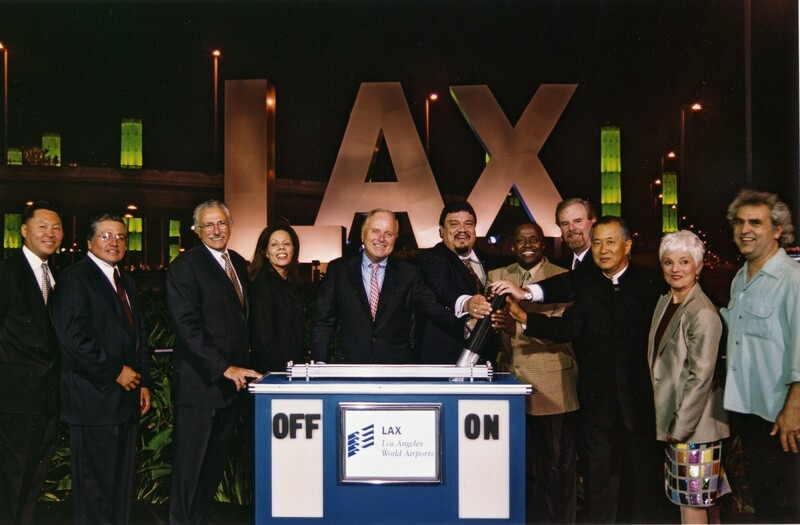 LAWA 75th Anniversary History Book - LAX Gateway at sunset, Theme Building and Control Tower in center, 2000. Consultants Landscape: IMA Design Group, Inc.
Public Art: Michelle Isenberg, Isenberg & Associates, Inc. Consulting Architect: Nadel Architects, Inc.
Geotechnical Engineer: Koury Inspection & Testing, Inc.
Electrical: Helix Electric, Inc. , Boyle Engineering Corporation, Moody/Ravitz/Hollingsworth Lighting Design Inc.
Glazing: Woodbridge Glass, Scott Wallace Structural Engineers, Curtain Wall Design & Consulting Inc.
Traffic Engineering: Traffic Control Engineering Inc. 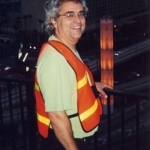 Location: Century Boulevard median between Aviation Boulevard and Sepulveda Boulevard. 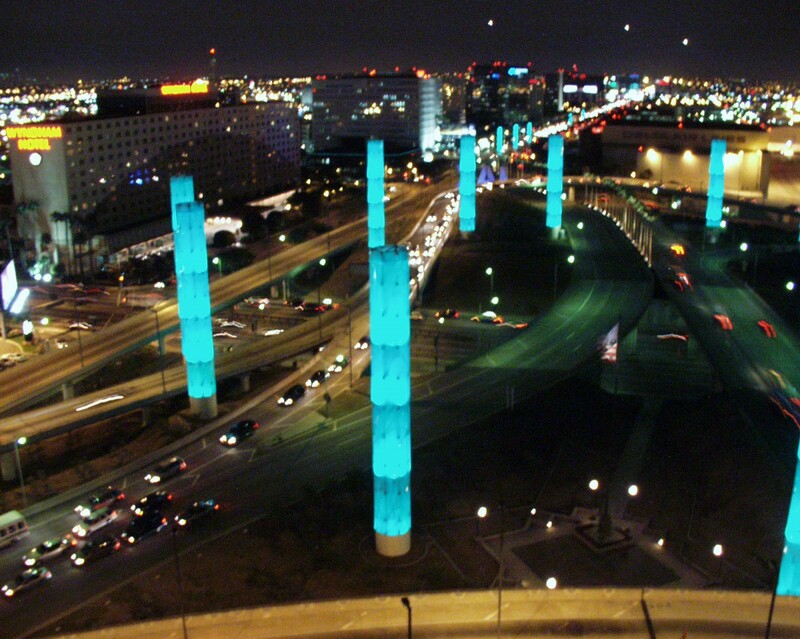 The pylons ascend in height as they approach the airport toward Sepulveda. 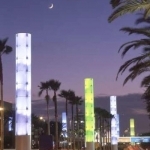 The pylons are lit from dusk to dawn in a variety of colors and sequences -- a kinetic light sculpture incorporating synchronized color arrays, movement and patterns utilizing digital controls. 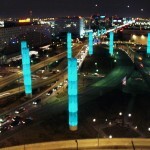 The public art is visible to airline passengers at 3,000 feet. 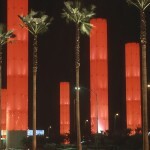 The twenty-six (26) pylons were originally outfitted with 736 individual lighting instruments, emitting over 30,000 colors and transitions. 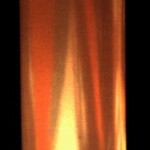 Most of the individual lighting instruments were in clusters of four, in various levels inside the pylons. 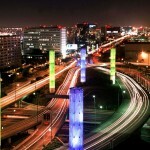 The public art is the world's largest permanent lighting installation in the world.